Upon arriving at the Hostel’s doorstep, you are faced with a glass door and a small landing leading up to a staircase going up to the 2nd floor where the “lobby” is. I doubt if the width of each floor would go over 4 meters. In each floor, there are 3 rooms: 6-bed dorm, 4-bed dorm, and single/private room. There were only bunk beds in all the rooms, leaving you with just enough space to turn around. Since the space was narrow, it’s only logical that the building is tall. So on the first floor, we have the small landing and stairs and the lobby, office and computer terminals on the second floor. The rooms are on the 3rd, 4th and 5th floors. Going up four flights of stairs may not be the greatest thing to encounter after a long day of travelling, but it pushes you closer to sleep. Which is good, because their mattress and pillows aren’t great sleep-inducers. Despite my complaints about inadequate space and too much stairs, I’d have to give Hostel Thailand credit for the clean rooms and toilets. What they lack in space, they make up with the great people behind the counter. You are always welcomed with a warm smile and greetings whenever you pass through the lobby. They’re only 5 minutes away from the BTS Chong Nonsi station and 15 minutes from BTS Saladaeng station by foot. If you still have the energy (or haven’t passed out from the heat), you can walk all the way to the Silom MRT station (about 20-25 minutes). 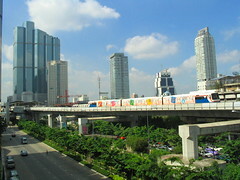 The airport bus stop (A1 Silom) is only 7 minutes away by foot. Since it’s in Silom (the central business district), there’s a number of small food stalls serving the local office workers. You dislike stairs with a passion. You don’t like the thought of being able to shower while you’re sitting down on the toilet bowl. Airport Bus – Take the A1 bus going to Silom. Tell the driver to drop you off at Soi 7. If you have a hard time communicating with the driver, show him the Hostel Thailand ad in one of the free maps you picked up at the airport. After getting off the bus, walk towards the corner, where the BTS tracks turns to the left. Turn left at that corner, and look for the Hostel Thailand sign. BTS Chong Nonsi Station – Once you get down from the station, walk towards the corner where the BTS track curves. Easy enough, eh? Interested to stay at Hostel Thailand? You can check rates, availability, pictures and book through Hostelasia.com. 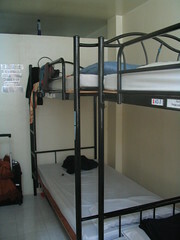 What you described about your hostel is exactly what I had to deal with in the military (Navy, precisely). The only difference is, your hostel is MUCH cleaner. It looks very clean. That’s a HUGE plus in my book. The lack of space & climbing stairs might be a mild nuisance, but at least it’s clean. Heck, it looks spotless in your picture! Clean is definitely good in my book. But the toilet! I regret not having any picture of it (why didn’t I take a picture anyway?!). The toilet wasn’t dirty or grotty or whatever, but it’s small. I’ve been in toilet cubicles that were bigger than their toilet & bath.